ReVision Energy's Barry Woods sees the future – and it's battery-driven. But in a largely rural state with long distances between work and home, 'range anxiety' remains a high hurdle. In the future, most Mainers will be riding in cars powered by electric motors. That day could come sooner if Barry Woods is successful. 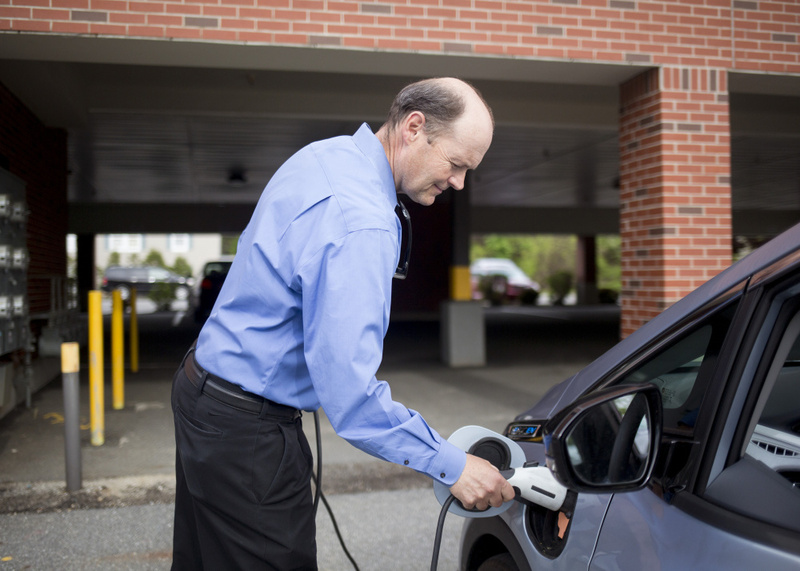 Woods is the only Mainer who has a full-time job promoting electric vehicles. As director of electric vehicle innovation for ReVision Energy of Portland, the state’s largest solar equipment installer, he has emerged as Maine’s leading electric vehicle evangelist. Despite low gasoline prices and America’s deepening love affair with small trucks and sport utility vehicles, ReVision sees a market opportunity. This year, carmakers are beginning to release a second generation of electric vehicles. There are 15 models that run completely on battery power. A few can travel more than 200 miles on a charge, and are priced within sight of conventional models. Thirty-three are plug-in hybrids – they run on their battery charge until they need to switch to a gasoline engine. Among them is a seven-passenger minivan that can go more than 30 miles on its battery. Woods’ job – and his passion – is to show people and institutions the elegance and logic of driving a vehicle that uses little or no gasoline, and in some cases, can get much of its fuel from solar-electric panels mounted at a home or business. ReVision isn’t a car dealer. But it has a growing fleet of electric vehicles and can sell and install everything needed to make home-charged driving a reality. Last year, it installed about 30 electric vehicle charging stations; it expects to double that in the next year with Woods on board. That’s the market opportunity. Business aside, what Woods is doing offers a glimpse of how Maine is slowly moving toward an electric transportation future. It’s a bumpy road, though. In a rural state, long distances between home, work and play demand well-placed charging stations, a network that’s costly and only now being slowly cobbled together. There are roughly 120 public charging stations in Maine, concentrated along the coast and in metro areas. Political consistency also matters. At the same time state government is working to develop a charging corridor in western Maine for electric-driving tourists from Quebec, lawmakers have been debating bills that would impose a $350 fee on all-electric vehicles, to help pay for road repairs. That would affect the roughly 400 of Maine’s 850,000 registered passenger vehicles that are fully electric. It’s a significant increase from the 150 or so registered in 2015. Another 400 or so are plug-in electrics. While the numbers are growing each month, they still make up a tiny share of vehicles on Maine roads. For the casual observer, pure electric cars occupy two ends of a spectrum. Impressive but unaffordable, like the Tesla Model S, which costs $63,000 after the federal tax credit and can travel 300 miles on a charge. Or affordable, but maybe not enough range, like the $23,000 Nissan Leaf, rated at 107 miles. 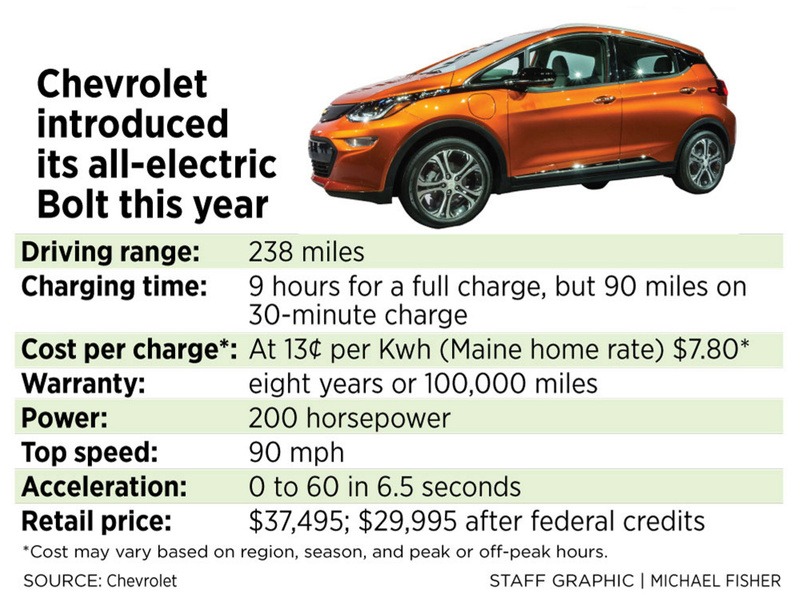 That’s why electric-vehicle advocates are excited about the new Chevrolet Bolt, which is rated at 238 miles and has a base, after-credit price of $30,000. ReVision recently got two of them. Woods is driving one, leaving his leased BMW i3 – a small, electric-gas car – at home. Two hundred miles is a game changer, Woods said. Most people only drive a fraction of that distance every day, so there’s less worry about running out of power and not being able to find a charging station. Even then, it can take from 30 minutes to eight hours or more to bring a battery to 80 percent of charge, depending on the car and the charging station technology. Range anxiety, as it’s called, is a leading obstacle to electric vehicle acceptance. Like gasoline mileage, electric vehicle range varies. But Woods was impressed last month when he drove the Bolt from Portland to Newry, then stopped in Sebago on the return trip. That’s 235 miles, but the Bolt’s range indicator told him he still had 30 miles of charge remaining. 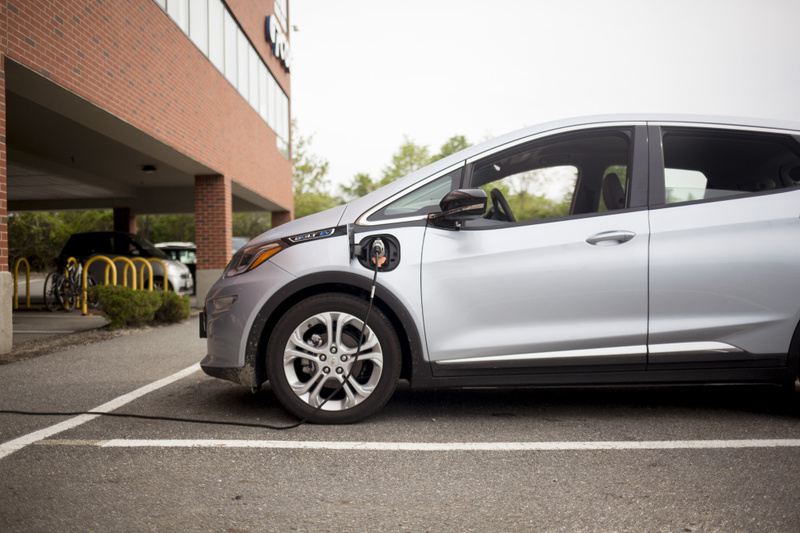 A Chevy Bolt charges in its parking space at the Greater Portland Council of Governments parking lot. “If you can go 200 miles and charge at home, that’s going to handle 90 percent of your charging needs,” advocate Barry Woods said. Woods, who is 56, came to be passionate about electric cars while living on the West Coast. He graduated from Bowdoin College and earned a law degree at Lewis and Clark College Northwestern School of Law in Portland, Oregon. In 2008, he became intrigued with the potential for smart electric grids, particularly the concept of using batteries to store power when it’s plentiful and less expensive and using it when demand and costs are high. Mainstream electric cars were in the planning stages then. But following a meeting in Oregon about plug-in vehicles, Woods had an aha! moment. He understood how millions of cars were really millions of batteries, and how a shift to electric cars could clean the air, fight climate change and encourage locally made energy. Woods became a charter member of what formerly was called Drive Oregon, an electric-vehicle advocacy foundation in the Pacific Northwest. He’s a director of Plug In America, which organizes National Drive Electric Week. In 2012, Woods became business operations manager for a maker of electric vehicle chargers, Clipper Creek. But Woods and his wife missed Maine. They got a chance to return in 2014, when he won a one-year Central Maine Power grant aimed at promoting electric vehicles. Woods helped install Portland’s first public fast-charging station, in the Fore Street Garage. It can bring a typical electric vehicle up to 80 percent charge in a half-hour. He also was involved with Maine’s first large workplace charging clusters, at Idexx Laboratories in Westbrook and Hannaford Supermarkets. Woods also started a company to speed up electric vehicle use, Electric Mobility NE, which is associated with the Drummond & Drummond law firm. Last year, he was hired by ReVision. Many people understand that Tesla, which is building the world’s largest battery factory in Nevada, is primarily a battery company that makes cars. It sees its future in energy storage. On a smaller scale, ReVision sees its future as an energy transition company that moves customers off petroleum. It already does this with heating and cooling. Now it’s expanding the concept to transportation. Phil Coupe, ReVision’s co-founder, just got a new Chrysler Pacifica hybrid minivan. The Pacifica is the first American-branded plug-in van. It can go more than 30 miles on the battery. Then a gas engine kicks in, giving it a range of more than 500 miles. Coupe also has solar panels on his house. A PIECE OF THE $2 BILLION PIE? Woods can help sell this vision because he has already been part of making the market happen on the West Coast. The scope is evident at a recent meeting of Drive Electric Maine, a stakeholder group co-founded by Woods. The meeting was held at the Greater Portland Council of Governments, which helps oversee a program to reduce petroleum use in the region. In the parking lot, a Volkswagen e-Golf and Kia Soul EV topped up their batteries at a charging station, one of 18 the agency installed with a $50,000 grant from CMP’s parent company, Avangrid. Later this month, two more chargers will go live at the State House parking garage. Woods co-chaired the meeting. On the agenda was a status report about a charging corridor for tourists traveling between Maine and Quebec, a plan being pushed by the province’s electric vehicle-friendly government. A big topic is how Maine can get the most from the $2 billion available nationwide for zero-emission vehicle investment, part of Volkswagen’s settlement for cheating on diesel car pollution controls. A lot of that money will go to setting up charging stations over the next 10 years. Woods also discussed plans for the state’s first workshop this fall for employers who want to install charging stations. He’s also promoting a private reception this month at Pape Chevrolet in South Portland, for a hand-picked group of potential Bolt customers. Pape has one Bolt on the lot and five on order. Two of those are already sold, according to Ethan Andrews, a salesman who’s heading up electric vehicles. Early customers are well versed about electric vehicles, Andrews said. For novices, range anxiety is the topic of conversation. Where are the charging stations? they want to know. “It’s getting over that misconception that people feel they’ll never be able to charge it,” he said. Andrews expects most Bolts to be leased, not purchased. He has started posting on Facebook to promote them, but expects Pape to also do conventional advertising. Andrews said that Woods has been instrumental in educating him about electric vehicles. Woods also has been a resource for the Maine Turnpike Authority, which is making plans for electric vehicle charging stations as part of a parking makeover at the Kennebunk rest areas. Mills equates electric vehicle development today with the transition from horses to cars in the early 20th century. But for Woods, the transition from pump to plug will require change on at least two basic levels. First there’s technology. Cars will go more miles per charge. Charging times will shorten. Prices will drop. That’s happening. Second is behavior. Car dealers, who don’t get questions about gas stations when they sell conventional cars, have to get educated. And carmakers must make a long-term commitment to electric vehicles. That’s just beginning.